Repeat customers are the lifeblood for any business – and most especially so for e-commerce businesses that lack brick-and-mortar outlets to attract walk-in customers. Returning customers spend 3X more compared to one-time customers, however, earning repeat sales from customers is getting tougher. Consumers are bombarded with an ever increasing number of choices from competitors who promise better prices, products and service. 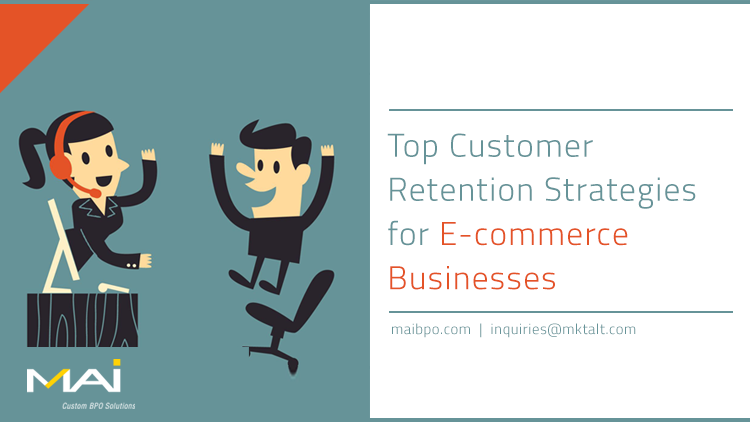 Here are the top customer retention strategies for e-commerce firms in today’s highly competitive business environment. There are no short cuts to delivering the highest quality products and services. Customers seek value for the money they spend and tend to remain loyal to brands that deliver maximum value on a consistent basis. However, quality and value alone will not insure repeat purchases. Customers have to be routinely prompted to visit, experience and purchase products in the first place. Successful strategies for prompting those customers to make repeat purchases include special offers such as free shipping, loyalty points based on spending that can be exchanged for gifts, free upgrades and more. Since returning customers account for 33.3% of the overall dollar spend, it clearly makes sense to offer them deals they can’t refuse! Always remember that value is in the eyes of the customer. One dimension of value is the cost element. Aside from competitive pricing, discounts, reward points, service and the overall customer experience all bring added value so it’s not safe to assume that price alone will continue to win customer loyalty. One way to add value is to revamp the e-commerce website by transforming it from a storefront into a reliable resource center. Customers are hungry for information and seek validation that their purchasing decisions are, in fact, based on factual information as well as unbiased product reviews. Making the e-commerce website a repository of complete, accurate product information, authentic customer reviews and more, you are providing customers with the validation they need to feel confident about their purchase. As a golden rule, never commit to what cannot be delivered, and always make sure to deliver what is promised, on time. About 83% of consumers regard trust as a primary factor in remaining loyal to a brand. Bait and switch tactics, such as attracting customers by showing a huge discount and then over charging for shipping defeats the discount and damages your credibility. Likewise, deceptive ads that append difficult-to-comply-with conditions in the fine print, are sure ways to lose favor with your customers. While most customers won’t take the time to complain, they will move on. Busy customers have enough on their plates without having to spend time on disruptive registration forms, convoluted navigation, complex shipping polices, never ending call-center menu options, complicated return policies, unresponsive social channels, and the like. Most customers who hit such roadblocks either leave immediately or vow never to have anything to do with that company again. Take proactive approaches to reach out to customers, either by adopting prioritized callbacks and IVR menus to connect customers faster to agents or empower them through self-service, without making them wait until the customer support executive is done servicing another customer. A case in point: While registration is essential to retain the customer, offering a lengthy registration form just before check-out, and worse, offering no way to go back to the shopping cart after the process, is a guaranteed way to lose the customer. Make the registration process non-disruptive by offering the option after the transaction is complete and seek minimal information. A well-designed, user-friendly checkout process reduces customer abandonment and boosts repeat sales. Customer retention depends on the front-end websites and apps, as well the backend processes. Listen to the customer. Take their feedback and complaints seriously. Listen to what customers are saying about the brand on social media and address the root causes of negative comments. Respond to every query or comment promptly. Reach out to unhappy customers on their preferred channel of contact to seek more information and make amends accordingly. Time-tested goodwill gestures such as a credit toward future orders go a long way toward appeasing customers who received a late delivery, incorrect shipment, damaged product or some other glitch. The customer support team is the backbone of an ecommerce firm and usually the only staff who comes in direct contact with the customer. Invest in them, train them, empower them. Make sure they are fully equipped to delight the customer with their interactions. While adhering to standard procedures has its benefits, there are exceptional cases where going ‘off script’ may be necessary to retain customer loyalty. KISSMetrics estimates about 71% of consumers having ended their relationship with a company due to poor customer service. People like to feel special and be part of exclusive clubs. Most businesses today offer loyalty points in a bid to induce customers to come back. However, today’s highly competitive marketplace requires more invitation-only services, priority deals, coupons on special occasions, cash-back offers for repeat purchases and so on, to offer a higher degree of exclusivity to their regular customers. Success usually depends on providing innovative offers that add a degree of novelty. There is no one-size fits all approach to prevent customer churn. The best tactics and strategy depend on the particular situation of the business. However, regardless of the methods, pay attention to detail and make sure customers enjoy consistent, quality experiences.